For over a month, as first reported this past Christmas, the TI-BASIC editor and IDE SourceCoder 3 has been back under development. An upgrade of the aging SourceCoder 2 project, it incorporates all of the features from the older tool and adds many new features, wrapped up into a spiffy web application. Spurred by feature requests from the community and newly-feasible technical aspects, I have implemented features like command completion, argument hinting, a sprite editor, and much more. 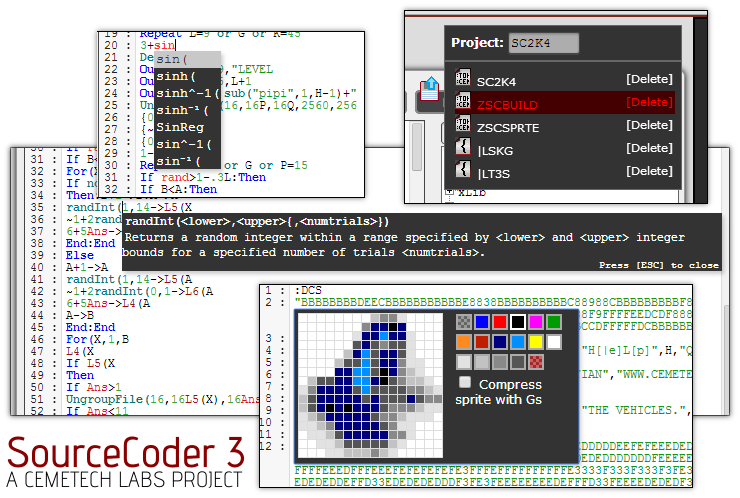 SourceCoder 3 can edit programs, lists, matrices, appvars, strings, pictures, images, and more. :: Editing TI-BASIC programs for the TI-83 Plus/TI-84 Plus and the TI-84 Plus C Silver Edition, Axe programs, and Grammer programs. :: Syntax highlighting for TI-BASIC, Axe, and Grammer programs. :: Command completion for TI-BASIC commands and some Axe commands by typing the beginning of a command and pressing Ctrl-Space. :: Argument hinting and command explanations for TI-BASIC and some Axe commands. For example, typing "seq(" displays the arguments to the seq( function, followed by a brief explanation of what the seq( command does. Thanks to Deep Thought and TI respectively for transcribing and creating these descriptions. :: Sprite editor for monochrome, 3- and 4-level grayscale, and 16-color TI-BASIC and Axe sprites. You can edit existing sprites in programs or create new sprites. :: Loading, editing, and saving lists and matrices, including importing from and exporting to CSV files that can be used by many numerical programs including Excel and Matlab. :: Importing and exporting Picture and Image formats for the monochrome and color calculators, allowing you to save calculator images as computer images and convert computer images to be viewable on your calculator. :: Embedded jsTIfied calculator emulator can emulate the TI-73, TI-81, TI-82, TI-83, TI-83 Plus/SE, TI-84 Plus/SE, TI-84 Plus C Silver Edition, TI-82 Stats.fr, TI-76.fr, and TI-83 Plus.fr. You can send files or projects directly from SourceCoder to jsTIfied and from jsTIfied to SourceCoder, allowing you to test out your programs without installing anything on your computer. :: Export strings, AppVars, and programs as syntax-colored HTML or BBCode, allowing programs to be posted on personal or school websites or shared on forums. :: Projects that include one or more programs, appvars, strings, lists, matrices, and real numbers can be stored in your Cemetech account and opened from SourceCoder on any computer. Projects can be imported from calculator files (.8xp, .8xg, and so on) and exported back to such files. So what's left before SourceCoder 3 is complete? Of SourceCoder 2's features, counting loop commands in TI-BASIC and indenting code are missing, and will eventually be added to SourceCoder 3. In addition, pictures cannot currently be saved as part of SourceCoder 3 projects. However, given the stability and completeness of SourceCoder 3 in its current form, I will be moving on to my next project and forcing all existing SourceCoder 2 users to switch to SourceCoder 3. Please enjoy SourceCoder 3, tell your colleagues about its many powerful features, and as always, don't hesitate to post bug reports and feature requests in the attached topic. Are our existing Sourcecoder 2 files available in Sourcecoder 3? Or do we have to migrate manually? Existing SourceCoder 2 files are available in SourceCoder 3. Once you open them, the editor will remind you that they have been converted from SourceCoder 2 projects, and will ask you to double-check that the conversion is correct. Once you save the project, it will be automatically upgraded to a SourceCoder 3 project. What sorts of hiccups in the conversion process ought we to be alert for? :Disp "NO, THaT'S NOT IT!" Anyone mind testing this for me? I used this to see how SC3 might go. As you can see from the syntax highlighting, Pause is not a token (you forgot the space) and Rand and Int should be rand and int respectively. Other than that, it looks good, and it also helped me just discover a bug in the feature that un-pauses jsTIfied when you open the jsTIfied pane in SourceCoder. Kerm: Looks great! one suggestion: Offline mode. Then I could copy it/download it and run it from home. Can't wait to use it some more. Thanks very much! It makes me much more motivated to feel appreciated. Tari pointed me to a Mozilla article on using the Application Cache present in some modern browsers, but that would be more useful for jsTIfied than SourceCoder. All of the tokenization/detokenization is done on the server, so an offline mode would only get you the ability to type on projects while offline. The Cemetech, Omnimaga, and ticalc.org users who have thoroughly tested SourceCoder, reported features, and suggested bugs. The Cemetech, Omnimaga, and ticalc.org users who have thoroughly tested SourceCoder, suggested features, and reported bugs. SC3 greeted me today. It looks cool, though the clipboard in the text window doesn't work the way I expect. Mouse-selecting text (in X) doesn't automatically copy it, and middle-clicking won't paste. Also, it seems I have to manually select Copy from the browser right-click menu to be able to paste something into another application—just Ctrl+C only works within the app. So it's a bit disconcerting. Would it be possible to make it behave more like a native text control? I'm seriously considering removing the "optimizations" for hybrid BASIC function names as being confusing and non-cross-subtype. Thoughts? - Indents and loop-counting: Those are both on my todo list for the final SC3.0. - Disable syntax color and help: I was only considering adding an option for disabling the command completion/argument hinting. Do people also want to be able to turn off syntax highlighting? - View and edit Unicode characters: I'm afraid I'm going to have to decline this one. It was a serious complication of SourceCoder 1.0 and 2.x. - Calculator keypad: With token searching, I think this is unnecessary. [/quote] It was meant to be a joke, but I guess it looks like I wasn't paying full attention to what I was typing (let me tell you a secret: I actually didn't mean to type that). I'll fix that. SC3 greeted me today. It looks cool, though the clipboard in the text window doesn't work the way I expect. Mouse-selecting text (in X) doesn't automatically copy it, and middle-clicking wont paste. Also, it seems I have to manually select Copy from the browser right-click menu to be able to paste something into another application - just Ctrl+C only works within the app. So its a bit disconcerting. I use CodeMirror for a vast number of things, including all of the fancy code-completion, argument hinting, and syntax-highlighting features. I was given to understand that it was relatively sane with copy-and-pasting. I am able to Ctrl-A, Ctrl-C within the editor window, and I'm not familiar with middle-click copying or automatic copy-on-highlight. Are other people having these problems? I've been having a problem that when I right click on some highlighted code in Chrome, it sends me to the bottom of the page, without opening up the right click menu where I can copy, cut, or paste. I can only open this menu if I was already at the bottom of the page. Fascinating, I sort of can replicate your problem. Chrome seems to scroll down when I right-click on code, but the menu still opens regardless. I'll see if I can track this down. [ ] Right-clicking code in Chrome (but not Firefox) makes the page scroll down. [ ] Toggleable indentation, syntax highlighting, command hinting? [ ] DOM Storage-saved preferences for above? From the zcc hello world topic talking about program names need to be uppercase, what about listening for value changed events on variable names and continuously converting it to uppercase? Because the theta character is spelled out as "theta" in lowercase letters. That reminds me: Why is SC3 saving programs like PVPCRAFT, for example, as c-PCRAFT, even with the program name properly being PVPCRAFT. Also, can there be an option added to let us choose the file destination when a program is downloaded? 1) Glitched name: and the program otherwise appears to be "PVPCRAFT"? I have never seen this glitch before. Can you give me more details for replicating it? 2) File destination: I'm afraid that's up to your browser. It seems that the only projects of mine that this issue occurs is "PVPCRAFT",its older backup "PVP", and the version of the game that's in the Cemetech Archives. Besides those programs, I don't know how else you could replicate it. There are 206 users online: 3 members and 203 guests. © Copyright 2000-2019 Cemetech & Christopher Mitchell :: Page Execution Time: 0.115267 seconds.